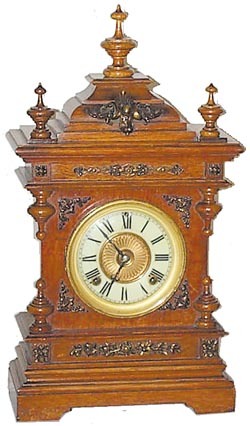 Ansonia Clock Co., "Cabinet A", ca 1894. There are 6 models in this series of mantle clocks, each similar, but yet different. This one is 19 inches tall, an antique oak case with brass trimmings. Case and ornaments extremely clean. Not refinished as there is an accumulation of grime still in the grooves and corners. It was probably cleaned with one of the mild modern cleaning products.Porcelain dial ring, gilt metal inner dial. French sash, heavy beveled glass. 8 day movement strikes a gong on half hours, running. Complete and all original. Ly-Ansonia No.846.